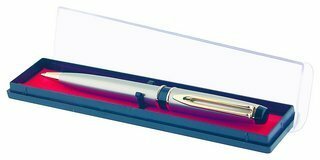 alue add your promotional gift pen with this Clear Pen Display Case with Coloured Insert. Pen Gift Packaging for one pen (pen not included). Red Insert. Can be pad printed with your brand or logo to add the perfect finishing touch.